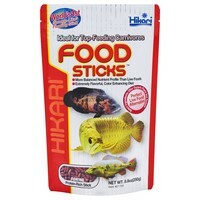 Hikari Tropical Food Sticks are a scientifically developed, floating stick for use with all top feeding, carnivorous fish thereby eliminating the need for live foods. Extensive research allowed us to make this nutritious food which promotes healthy form and vibrant colouration. Developed after extensive study and analysis of the sense of sight, smell and taste of numerous carnivorous fish. Inclusion of key ingredients like DL-methionine and L-lisine allowed us to produce a food most top feeding carnivorous fish are eager to eat. This floating diet helps reduce waste and aquarium clouding common with other floating sticks. The stick absorbs water easily and quickly becomes soft yet retains it's shape. State-of-the-art bio-technology provides the highest grade of carotenoid available today. This carotenoid enhances colour development and retention, keeping your fish looking their best year round.